A popular New Zealand pastime, Kiwis have skiing in their blood. Being so close to the Southern Alps, Skiing in Christchurch is one of Canterbury's biggest draws. Plenty of peaks, for all abilities, litter this magnificent landscape. Christchurch Skiing draws devotees from all over the world. On the opposite side of the island from the adventure capital, Queenstown, the area nevertheless draws skiers of all levels, attracted by the great facilities and superb quality of the snow. Methven/Mt Hutt is very popular, just 30 minutes from Christchurch. It has state of the art facilities, lots of places to stay, and great ski runs. Beginners get their own dedicated ski fields, as do the more advanced skiers, so it's great for families who may be at different individual levels. 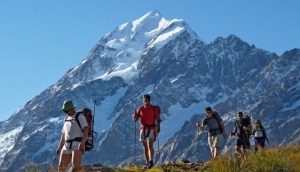 Further north is the Craigieburn Range and the Porters Heights ski field, Mt Dobson near Fairlie and, of course, the vast Aoraki/Mt Cook National Park. Accommodation is plentiful, especially around Methven and Springfield, Arthur's Pass and Hanmer Springs, if you wanted to really search out the best snow.